At first glance, Rick Doty seems like a likable guy. He has an approachable demeanor, he's a proud family man and has no problem befriending UFO researchers/ complete strangers on Facebook. Doty's name in the UFO community usually doesn't elicit the aforementioned responses, rather it usually brings about one word; liar. Doty, a former retired Special Agent who worked for Air Force Office of Special Investigations (AFOSI), is the subject of many debates and conversations regarding government-induced disinformation campaigns. Doty claims his innocence, and was even the subject of the documentary film "Mirage Men," which focused on government's most infamous cover-ups of alleged UFO cases. Critics claim he ruined some people's lives, namely Paul Bennewitz who was eventually placed in a mental health institute after extreme paranoia after being given supposed hoaxed documents by Doty to help discredit and turn away Bennewitz's UFO research. One UFO researcher referred to Doty as "the biggest liar in the world", so, we reached out to Doty to try to set the record straight. Everyone has a side of the story and a voice that deserves to be heard. The following was done via e-mail correspondence. Is Doty everything the UFO community says he is, or is he just misunderstood from a UFO community inclined to question everything and everyone? Q: Were you happy with how you were portrayed in the documentary "Mirage Men? " DOTY :No, I was not. Mark Pilkington falsified information I provided to him. He “voiced over” my interview. His intent was to portray the actual UFO story, not a disinformation campaign on his part. A good part of his book was disinformation, hoax documentation or just plain lies. Q:Rick Doty created and spread misinformation regarding the UFO phenomenon-true statement? DOTY: No, sorry, the only misinformation that is being spread about the UFO phenomenon is from UFO researchers. I have never spread any information that was incorrect. I’m not a UFO researcher. I don’t hang out in that crowd. The worse critics are those inside the UFO community. Phil Klass once said at a UFO Convention, “People within the UFO community do more harm to themselves that I could ever do”. I have never written a book, spoke on a speaking tour or have my own radio/TV show. How the hell could anyone say I’m spreading misinformation? Q:The field of Ufology is always muddled with half-truths, disinformation, in-fighting and every case or expert is questioned and debated. Would you say if goal was to create this divide by planting the seeds of doubts in ufologists; mission accomplished? DOTY: I am not a member of the UFO community. I am not a member of any UFO club, organization or clique. As I said before, the UFO community does more harm to themselves with all the in-fighting and discredits than anyone from the outside could do. Q:Is Tom DeLonge another Paul Bennewitz? DOTY: I have no idea what you mean about comparing DeLonge and Bennewitz. I am not following DeLonge and have never had anything to do with him. 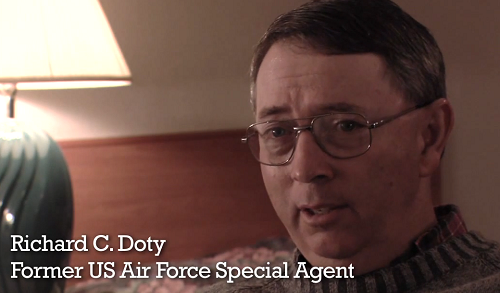 Q:What should people know about Rick Doty the person, which they may not know? DOTY: Every single assignment or mission I completed during my AFOSI career was totally sanctioned by the U.S. Government. I did my job and was given awards for my superior performance. After my retirement, I tried to spread the actual truth about the past U.S. Government involvement in UFOs. However, I was criticized, defamed, and humiliated by UFO insiders because the truth did not coincide with their beliefs. I fought back several times. I have been hired by producers and have written numerous scripts for TV/movies. Everyone who had knowledge of the real U.S Government’s involvement with UFOs know I’m telling the absolute truth. Q:In your opinion and through your background, how many theories/cases about UFOs are fully fabricated (and be specific if you can)? DOTY: I deal with fact…the truth. I don’t read or pay any attention to wild theories about fake UFO stories. I know the truth. I know what the U.S. Government did in the past, and I know what I did during my 11 year OSI career. I was briefed into the program and I was given access to highly classified information. I’m content that everything I read or saw was facts and not some disinformation program.